The Skeeterskate (ミズンボウ?, lit. : "Water Hat") is an enemy that appears in Pikmin 3. 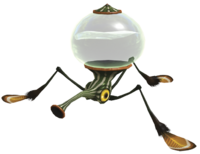 It skims around the surface of the water, and attacks by shooting small jets of water at the Pikmin and leaders. It can be killed in one hit by throwing a Pikmin on top of it, much like a Dwarf Bulborb. The Skeeterskate will skim across the water aimlessly until Pikmin are nearby. Once it spots Pikmin, it will inflate the sac atop its head and fire jets of water at them. A single shot of water will splash on the ground and affect all Pikmin within a small radius. Skeeterskates are easiest to hit when the water sac is empty, as they will stop to refill it, so it is a good idea to run behind it with Blue Pikmin and throw them at such a time. In certain areas of the game, the player is forced to fight them without any Blue Pikmin. In this case, it is possible to walk into the water underneath, then swarm them with Winged Pikmin. If a Skeeterskate is close enough to land, it is also possible to kill it with any other kind of Pikmin with a single toss, but the player must be ready to rescue any Pikmin that risk drowning. "Skeeterskate" is a play on the terms "skitter" and "skate", with both meaning "to glide along a surface". In Japan, it's called ミズンボウ? which means "water hat". Its internal name is amembo, which refers to the word アメンボウ? which means pond skater. A skeeterskate in the Distant Tundra. Early E3 2012 screenshot of Skeeterskates in a water-based location. The Skeeterskate is the first tripedal creature in the series, the second being the Quaggled Mireclops. This page was last edited on March 15, 2019, at 21:03.